the Streets provide access to localized shopping. Angeline Street has no problem with our ability to do that, order and she confesses that there are times she has a hankering for out-of-season strawberries and will make that purchase, search knowing the strawberries didn’t originate here. 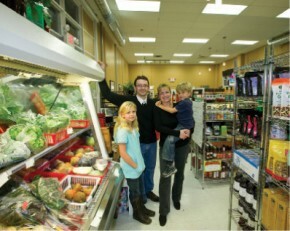 At the same time the philosophy and marketing belief she shares with her husband and business partner James is to encourage a local and healthful connection for your grocery marketing wants and needs. The bonus is, the Streets provide access to localized shopping. commitments, parties, cooking, baking and stress. By organizing your time, your home, your finances and your priorities you can really relax and enjoy the season. Christmas is marketed as a joyous and abundant time of year and for many this is true, but it can also be a time of anxiety, grief and financial concern. It is important to stay balanced and honor the things that are important to us so that we can accept everything that comes with the season. Keep Christmas simple! As the invitations start rolling in for various holiday events, decide which ones are the most important to you, RSVP and then immediately put them into your calendar. Leave days or times open closer to Christmas so that you can spend time with friends and family in combination with getting ready for the festivities. Take time to honor any grief you have at this time of year. Share this with the people around you and this too will become a meaningful tradition for the season. Décor… This year, consider living by the less-is-more rule. Go through your decorations at the end of November and decide if there are any that you would like to take to a local charity. The stores are full of beautiful new bobbles and it is easy to get carried away in this season of shopping. Think about the space you use storing these items year to year and consider that the more items you have, the harder it is to focus on the really special decorations you have up. It is good to find balance between a festive home and a ‘Christmas catalogue’. Over-consumption applies to bobbles as much as food this time of year. Choose a theme you want to work with—ideally one that incorporates items you already have and keep that in mind when you are out shopping. Plan ahead… Purchase your Christmas decorations, cards and gift bags in the New Year so that you are already ahead when Christmas 2010 approaches. By keeping your décor simple and timeless, you needn’t worry about starting over with new trends. Instead of purchasing wrapping paper each year, start buying gift bags and keeping them from year to year. Store them in with your Christmas decorations and reuse them—they will last for years. You can reuse the tissue paper as well just by folding it up and packing it into a larger Christmas bag. Recycling is great but re-using is even better! Budget for the holidays not just for the gifts… If Christmas puts a stress on your finances and you have never put together a budget, now is the time to start. Write a list of all the people you are buying gifts for and everyone you are sending cards to. Note the cost of cards and postage for your mailing list. Next, decide on the amount you would like to dedicate to each person on your list. In the New Year, you may find it useful to think about buying gifts throughout the whole year as you will be able to spread the cost out and find that perfect gift long before the Christmas rush. Some people thrive on the last minute shopping but if the crowds stress you out, think about purchasing gifts in advance. Create a budget for all the things you may purchase over the holidays. Your list may include: food, decorations, tree, gift bags/wrapping, clothing, meals out, extra power for lights. You can keep your lists in a binder, a notebook or a Christmas organizer. Christmas organizers allow you to annually keep track of your budget, your holiday activities and the gifts and cards you sent. Presents… Start thinking of presents long before the stores start playing Jingle Bells. By spending time with friends and family you will know what to get for them long before the Christmas rush. Make a list of everyone you will be getting gifts for and leave a space next to their name so that you can jot down ideas and/or the gift you have for them. Start your gift list as soon as you start purchasing gifts so that no gifts are tucked away and forgotten. You may also want to note your budget for each person’s gift and get an idea of the total you can spend. If you are making gifts be sure to jot down your idea and how long it will take to complete each gift. This also makes shopping for each person a more personal and enjoyable experience. Be sure that your lists are in a place that can not be spotted by curious eyes. Cards… By making lists and keeping on top of mailing dates you can ensure that all your cards get to their destination on time. Go through your address book choosing who you will mail cards to and write down everyone’s name in separate columns based on where they live (ie. Europe, Asia, Canada or local). Each year Canada Post puts out a list of suggested mailing dates. Visit canadapost.ca for this year’s dates. Food… This is the time to create a feast for the freezer. Start baking at the end of November so that your freezer will be full of treats for the holidays. Look for recipes that freeze well. Appetizers, cookies, squares and many others are great ‘fresh from the freezer’. These are also perfect for last minute offerings at parties you are attending or as gifts in a decorative tin. The more preparing you do in advance the more time you will have for the things that will need prepared on the day. Menu planning and lists will save you a lot of time and hair pulling. In early December decide what your meals will be in the lead up to and at Christmas. Double your meals in November and December and freeze a batch for those busy nights before Christmas. Then, all you need on the night is a fresh salad and refreshments. Delegate. Draw up a chart outlining who in the family will prepare each meal and who will clean up. This will minimize kitchen chaos and give you a break from food preparations. Set your table as you clean up from a meal. That way you can dry the dishes and put them right on the table. It also eliminates congestion in the kitchen when meals are being prepared. Share the feast. Ask your guests to bring containers for leftovers or purchase Ziplock bags so that your friends and family can go home with their own mini feast. If you are hosting over the holidays be sure that you can relax and enjoy your guests. Tackle any untidy areas of your home in advance so that you aren’t fretting over them while guests are visiting. Put summer jackets and shoes into your bedroom closet so that your company has a place to put their winter wear when they get to your house. Purchase some essential oils that will give your home a wonderful Christmas ambiance —pine, cinnamon, sandalwood etc. These scents combined with the wonderful smells of baking (fresh from the freezer) will be a wonderful welcome for your guests. Traditions… Many families are unaware of how many wonderful traditions they have. The traditions people incorporate into their holidays are as unique as the people who started them. Traditions should have meaning for the people who participate, so telling the story of how the tradition originated is part of its importance. Traditions can be as simple as eggnog in coffee instead of cream or as complex as the rituals completed over eight days for Hanukkah. Games, food, decorating the tree, and present opening are all areas where traditions are honored year after year. Traditions are organic, ever changing wonders. Involve your children and friends in creating new traditions or modifying existing ones. If there are traditions that are stressful and/or are no longer meaningful to you, talk to your family about devoting that time to something else. Close to Home… A more personal and enjoyable Christmas experience starts at your home and in your local community. In the weeks leading up to Christmas consider getting together with a group of friends to work on Christmas crafts/gifts. Share stories, great food and the excitement of making wonderful things for the people you love. Getting together with a small group of friends is a wonderful way to inspire and motivate your homemade gift projects. Keep your eyes open for craft fairs and events put on by local artisans. Local papers advertise the various fairs. By planning ahead, staying within your budget and supporting local businesses you will find the Christmas season a more enjoyable and personal experience. Your pocketbook won’t be hurting in January and your gifts will be infused with thought and love. Most importantly, you will be free to really enjoy the holidays, your home and the people that fill it with life and laughter. For more organizing tips please visit breathing-room.ca.